Jason Perlow wonders if the 2012 Olympics will melt the Internet. It may already be happening. Here's the good news. If you are one of the athletes, officials, accredited media or accredited hangers on for the London 2012 Olympic Games then you'll likely have a wonderful Internet experience. The London Olympic Games organisers have spared no expense in ensuring that the British tax payer picks up the tab for BT's gargantuan venue network. Rachel King has the juicy Cisco details. 33-to-1 that flamboyant London Mayor Boris Johnson accidentally lights his hair on fire with the Olympic torch. I can't find odds for an Internet crash. If correct, then that's a serious #fail. I'm sure someone will correct me on this minor point. ...many spectators will find themselves paying £5.99 for 90 minutes of access, £9.99 for 24 hours or £26.99 for five days. In other words, that's about $9.27, $15.46 or $41.77, respectively. Existing BT, O2 and Tesco Mobile customers will be exempt from the fees though, able to enjoy the same access as everyone else without the cost. One way the games uber lords are hoping to mitigate potential failure is by banning the use of mobile hotspots . Dang - no flooding the network via your mifi device. Elsewhere in London, David Meyer fills us with joy in noting BT has upgraded some wifi hotspots so that if you are - say - getting your lunchtime sandwich in Marks and Spencer on Oxford Street then you get free wifi. I'm wondering what the effect will be on check out queues. But it is the wider Internet and business use that worry me. Businesses can rest easy about disruption to broadband connections during the Olympic Games, the government has said. Despite its message of reassurance, the Cabinet Office on Friday was still telling businesses they may need to take preventative measures, noting that their contract with their ISP will dictate how stable their access is. "If a significant number of employees were to watch the live streaming of an event, it could significantly slow a company’s network speed, if there is not enough network capacity available to cope with the increased traffic demand," the government spokesman said. "Companies could choose to have certain types of internet traffic prioritised to protect business-critical internet access," he added. Don't get so wrapped up in work that you forget that the world's greatest sporting spectacle is going on. And while you might not be a huge fan of the long jump or discus, your colleagues or your boss might be. So before booking in that meeting it might be wise to check which events are taking place and when, and whether you'll be upsetting any fans. After all, if it's a heat for the 100m, it's not likely to take very long. Heh Steve, you're already on the hit list of disrupters. Ten seconds or thereabouts is plenty long enough to screw up an internet connection. And Jason Perlow once again suggests Internet meltdown . He did the same in 2008 and got it specatacularly wrong but this time he may have a good point. It may already be happening. Today's the day that the Olympics infrastructure really starts to get put to the test as the Games-only traffic routes open and the traffic jams begin. From a personal point of view, I'm already concluding that those optimistic press releases that assured us all that the UK's internet infrastructure would not be impacted were not entirely accurate if the suddenly grindingly slow running of my broadband is anything to go by. Cloud wasn't judged appropriate for critical systems this time by the Olympics ICT management - although thank you to all those PR firms who sent me effectively the same press release about their client having done a survey on how the Games will lead to lots of remote working and more use of Cloud apps. You'll have to excuse me now - I'm outrageously attempting to open my Gmail at the same time as the Olympics website and my 'unaffected' broadband is struggling under the strain. In the interests of fairness, here's the story Stuart wants us all to read about the Olympics infrastructure legacy. If anyone from Weymouth (the place they have the boat racing thingy) is experiencing problems do let us know in comments. If anyone from William Hill, Ladbrokes or Paddy Power is listening - let's see those odds. 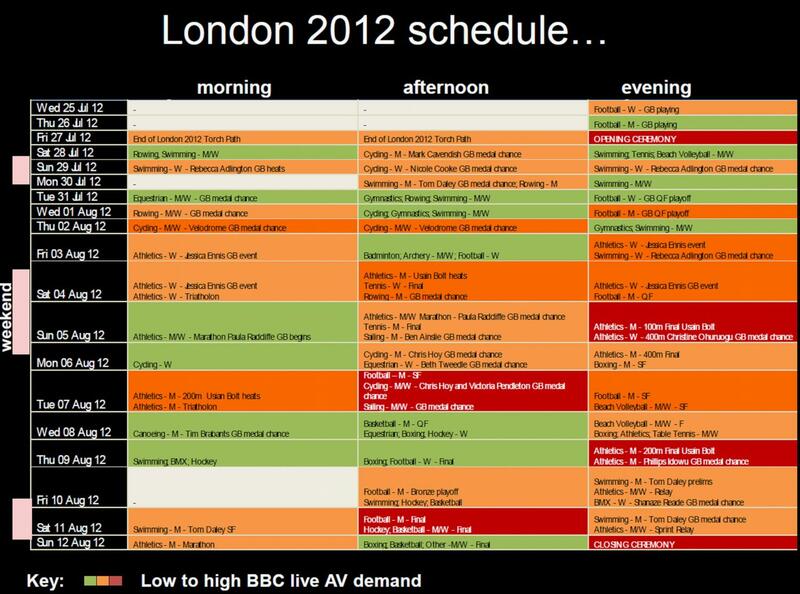 In the meantime, here is an incredibly helpful list of BBC predictions about event hotspots. These should help you plan when you DONT want to be trying to connect to the Internet - for work, play or errr...watching the games on your new fangled smartphone. Me? I'm staying away. A beach somewhere figures large in my plans. Or maybe a Mountain Lion upgrade? Image credit: Trefor Davies, CTO Timico who has lots of lovely facts and figures on the telco around this monster event. UPDATE: BT says I am factually wrong on the taxpayer jibe but I can't find any facts to support their position. What I have found is this breakdown of costs which may or may not include costs related to BT's infrastructure. Nothing in the latest BT Olympics specific fact sheet in the investor section talks to the funding (PDF.) Neither does the latest Q4 earnings slides. BT has said it will email me on this topic.